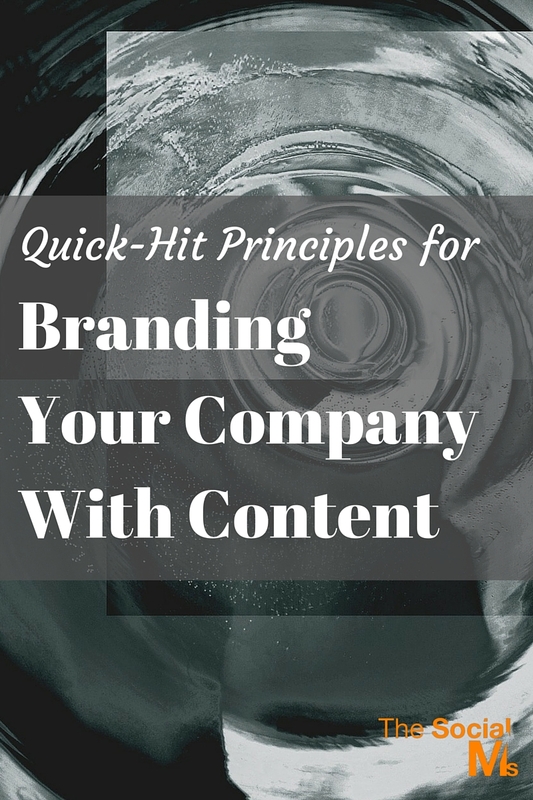 Do you use content to brand your company? If you don’t, you’re missing out. Sure, the logos, colors and pictures you use are all contributing to making your brand, but they are far from the only factors. Content can play just as big a part. In fact, it can be even more effective than these others choices as it can come in under the radar. People know the logo you have, the pictures you choose and the colors you use are meant to create a brand. Most haven’t yet clued in that your content can serve the same purpose. And so they don’t process the message it brings centrally, but they process it peripherally instead. And so, you can establish your brand without your visitors being any the wiser. Though you can certainly use branded content to create content branding, the former is only a small wedge of the content branding pie. In case you’re not familiar with ‘branded content,’ it’s where you pay to put content in ads or other locations where people will see it. So slogans displayed prominently on a billboard are branded content. So is the copy that explains a product in a magazine ad. The stuff on your website, blog or in your newsletter, on the other hand, are not branded content, but they can most certainly still aid your branding. Content branding is where you use content to shape people’s perception of your brand, which means any content can theoretically perform content branding. All content can influence the perception of your brand. In fact, in some ways, the other stuff you’ve got on your blog is going to be more effective in doing so than your home page and your about page. We all know the stuff there is crafted, but we don’t quite feel the same way about the stuff that on blogs, for example, or on social media. And yet these can serve just as much to give your brand that dimension you’re looking for. With social media, you can make your brand appear fresh and exciting, for example – which will then get transmitted onto your brand itself. Similarly, with good blog posts you can come across as authoritative, witty and on the ball. And again these characteristics will then become associated with your brand. The takeaway is that all content can help branding, and therefore none of it should be of poor quality. Always make certain you use high-quality content creators, to avoid having the wrong messages associated with your brand. However you decide to position your brand, be it as something smart and informed, or something funny and edgy, you always want to make certain that the certain that your content always puts the users first. What do I mean with that? It means that though your ultimate goal might be (read: is) to sell your product, that should never be the focus of your content unless that’s what your visitors are actually interested in (as in, they’re looking into what product they want to buy). Instead, the focus of your content should always be to serve the customer’s needs. If they’re looking for information, then that is what you’re aiming to supply first and foremost. So, if they got to your page by asking the Google ‘what is the use of a widget?’ the first thing on your page shouldn’t be ‘buy my widget’. Instead, it should be an exhaustive study of what the use of a widget is, when they’re useful and when they’re not. That last one is vitally important as it makes you come across as unbiased, which will mean people are more likely to accept the rest of your opinions. Then, in the end, you can ask ‘interested in buying a widget?’ and a link to your own product. Since the internet is more and more becoming a place of reputation (as in, we link to sites with good reputations, and we don’t link to ones with bad ones), it is vital that you maintain yours. In fact, in some ways, branding is reputation. And for that to happen, all content creators must be on messages as well. So take the time to sit down and make certain that everybody in your team – whether employed or freelancing for you – understands your brand values. The best thing you can do is write up a document that you can send to anybody who writes content for you. And every time somebody asks a question, or points out a problem, or has a realization, make certain that you update the document to represent those values. Also, make sure that the document isn’t just an abstract mumbling about ideas like ‘friendship’ and ‘reaching out’ but also contains concrete examples of what you do and don’t do (do you like adjectives, do you use exclamation marks, how long should paragraphs be, etc.). For some, the abstract ideas might be enough, but for many, translating those kinds of thoughts into the correct copy will be hard. If you produce only a little bit of content, then you can stop reading right there. If, however, you’re one of those sites that is relying heavily on content marketing and don’t do a lot of other forms of marketing, then almost inevitably your content and your marketing will become one and the same. After all, the main way that visitors and users interact with your brand is through the content it puts out. What does this mean? It means that if you’re seeing content creation as a clever marketing strategy to get people to come to your site, then you’ve got too narrow a view of what content is. It is not an arm of your marketing strategy. Instead, it has become central to your branding. This means that your company can be made or break based on what you’re putting up. This outside reality should be reflected inside your company. Your content creation should not be something that your marketing team does, without much input from the rest of the company. Instead, it is vital that the whole company plays a part. This will serve two purposes. The first is that the whole company will understand the message that you’re projecting, which will help to bring you all on message. Secondly, with everybody involved in content creation the quality of your content will rise and you’ll actually end up ahead of the content trends. Largely, this will be because the rest of your team will have suggestions and ideas that your marketing team alone will not have thought of. And so you can start putting out specialized articles that are actually original and informative. And once you start having those, the perception of your brand will change to where people will equate it with being authoritative, informative and a go-to resource for information within your specific niche. In other words, your content will be doing your branding. Yes, of course, your images, your logo, and your color choices will all matter in making that initial impact, that initial definition of what your brand is. And those initial impressions will be strong. But they are not everything. After that, it’s going to be the far more subtle things that are going to have an impact – the words you choose to use primarily among them. So don’t miss the opportunity to reshape how people see your content. After all, you’re spending so much time on content marketing anyway, why not use it to brand your product as well? To not do so is to waste a valuable opportunity.